George Philp, President and CEO of the Acadia Students’ Union (ASU), has worked in various ASU roles to combat student food insecurity and to prevent sexual violence and reduce alcohol harms within the Acadia community. He has also represented Acadia students to the provincial and federal governments. Philp’s scholarships and awards include the Golden A, an award for academic excellence, outstanding leadership, and contributions to the Acadia community. As a boy of 12 living in Barrie, Ontario, George Philp (’18) first came to Acadia when he and his family visited Wolfville on a family road trip through Nova Scotia. Now President and CEO of the Acadia Students’ Union (ASU), Philp graduated in 2018 with a BA (Hons) in Environmental and Sustainability Studies. During his time at Acadia, he worked as both a Research and a Teaching Assistant. In his past and present roles with the ASU – before becoming President and CEO, he was the ASU Sustainability Officer – he worked to launch the ASU Food Cupboard to combat student food insecurity, advocated to prevent sexual violence and reduce alcohol harms within the Acadia community, and represented Acadia students to the provincial and federal government on student issues. 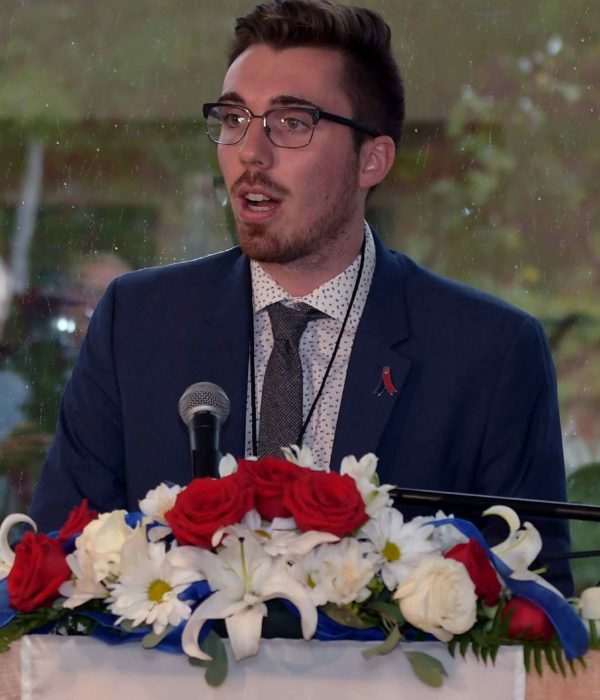 “From sharing a pint at the Axe to studying with friends, and from conducting research alongside faculty members to working with fellow student leaders to improve student success and campus life, my Acadia experience has been so meaningful because of the incredible people I’ve shared it with,” Philp says. While at Acadia, Philp won the Kirton Scholarship for academic excellence and leadership, the David D. Smith Scholarship for volunteerism and leadership in student government, and the Golden A award for academic excellence, outstanding leadership, and contributions to the Acadia community. “As a student and a student leader, I know the valuable impact that scholarships and modern learning and social spaces have on the quality of student life at Acadia,” he says. “For me, the Campaign for Acadia is about supporting our current and future students in accomplishing extraordinary things both in the classroom and throughout our campus community. That’s why I’m proud to represent Acadia students on the Campaign Cabinet.